White snow and red blood, eh? Who'd have thought? Noun & adjective. Also (archaic) baresark, bersark; (chiefly as noun) berserker, -kar. Early 19th century. I was really hoping to find a historically accurate depiction of a Norse berserker to lead this post but, alas, after way too much time spent searching, I couldn't. Being something of a cliché, I found plenty of pictures, of course: vampire berserkers, demon berserkers, berserkers with bionic arms, berserkers carrying swords the size of trucks, even hamster berserkers. 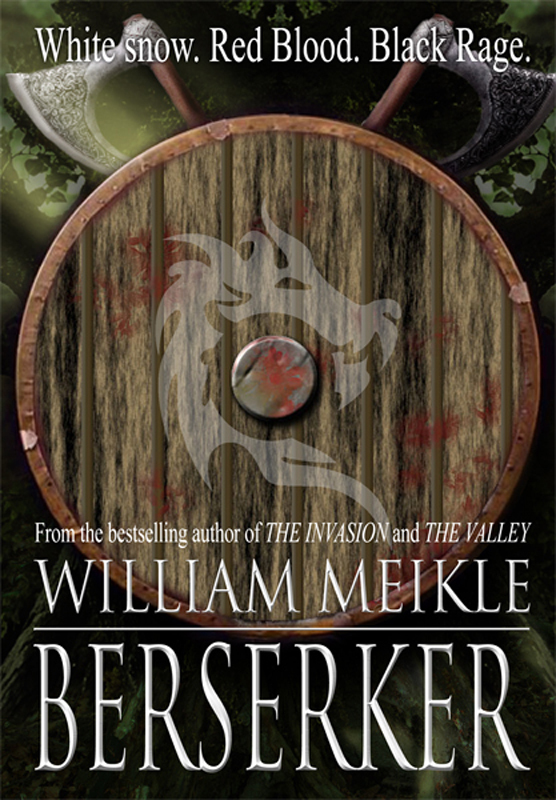 You'll have to settle with this, however: the cover of William Meikle's book Berserker. No, I've never heard of him (or it) either, but it has good reviews on Amazon so if it floats your longboat you should have a squizz. As for the word berserk, well it's just rather interesting, isn't it? Rather like the word amok, we use it a lot without giving much thought to the historical depth that lies behind it. Personally, I find it rather pleasing to think that an adjective derived from frenzied, bloodthirsty, possibly drug-addled Norse warriors can now be applied to Cindy, the receptionist that got drunk at the office Christmas party, overturned a table of drinks and accused Malinda from accounting of sleeping with her husband. That's rather cool. Have you gone beserk recently? Is the berserker your favoured character class when playing Dungeons & Dragons? Have you, like me, struggled in vain to find accurate artwork depicting berserkers (apparently they're not ideal portrait models)? Do please comment below. How is this actually supposed to be pronounced? I usually say b'serk. It has two syllables, stress on the second, as in: buzz-URK. You can hear it by clicking here. I wish I could go berserk every once in a while; I bet it rids you of a lot of built-up frustration. The only way I can get rid of frustration and stress is wallowing in self-pity and crying fits. Maybe slashing people in half with a larger-than-life sword would be less socially accepted, but hey, it might be a great stress reliever. This has got me thinking, Bibi. I don't think I've ever 'gone berserk' in my life - I've never screamed abuse at anyone, I'm never attacked or fought anyone other than in self-defense, I've never thrown or kicked or punched objects. Hmm. Am I missing out on something? I don't know if you're missing out, I've never done any of that either. I've never even fought in self-defence so I wouldn't even know what it feels like to punch someone in the stomach (although I do know what it feels like to BE punched in the stomach, and let me tell you, once was enough). It's a lot safer just to sing about it (in NSFW fashion). Plenty of berserkers in Game of Thrones. I'm a girl and I never get bored during battle scenes.